It was the masculine I revered. Let me be more like my dad and less like my mom when I grow up, I secretly hoped. My dad was career driven, in charge, a successful CEO, and strong. All of the women in the family—my mom, my sister, his sisters, and I—adored him. As far as I could tell by looking out into the world, men were in charge. Even in my religion of birth, Catholicism, it was always about the men. Women were cast as mothers, wives, and whores to support the masculine or be shunned. It wasn’t until I started studying The Tantric Dance of Feminine Power ™ that I realized I wasn’t even close to embodying my feminine self. I was mimicking an idea of what I thought that was. The first time I saw a woman do this subtle body practice, I wasn’t really sure what it was I was watching. All I know is that she was moving in ways that you don’t normally see out on a dance floor or in your typical dance class. And when she was done and she opened her eyes there was this expression in them that seemed to cry out, “epiphany!” Only, what about? Then it was my turn. I stood up. Following the teacher’s instruction, I closed my eyes, spread my legs hip-width apart, bent my knees slightly, focused my attention on my womb and waited… for what, I wasn’t sure. What if nothing happens? What if I stand here the whole time the music is playing and I’m boring to watch? Maybe I should start wiggling my hips around and make this dance happen. And then something did happen. There was this rush of energy that seemed to come directly from my pelvic area. It rose like a geyser through my core, my chest, my neck, my arms, until I too was moving in unfamiliar ways. Except that I wasn’t moving my body, it was the energy moving me: pushing one hip forward, the other hip back, raising my right shoulder, extending my left arm upward. And the energy kept coming in waves… growing thicker and thicker like molasses. What is this? Who cares! This feels amazing! Through The Tantric Dance of Feminine Power ™ I discovered that there was more to inhabiting my female body than meets the eye. I started to pay more attention to what was going on inside me rather being so concerned with how I look. Instead of focusing so much on what the man in my life was doing or saying, I began listening more to my voice and paying attention to my desires. I started to move in my body (and later in the world) from a place of genuine impulse that had nothing to do with pleasing anyone but me. I learned how to access my real feminine power—the one that comes from within and not the “power” that’s really just about whether or not I can capture the attention of a man. I stopped putting my passions and dreams aside whenever I got into a romantic relationship. I am by no means perfect at any of this. But what I now know for sure that women are more than just the second fiddle to men. We are equally important and just as worthy of reverence. Webster’s Dictionary offers several definitions for the word “sacred,” including: “highly valued and important, entitled to reverence, entitled to respect.” The feminine is sacred. Saying that mothers (or any female) embody the Sacred Feminine isn’t sacrilege. It’s holy truth. 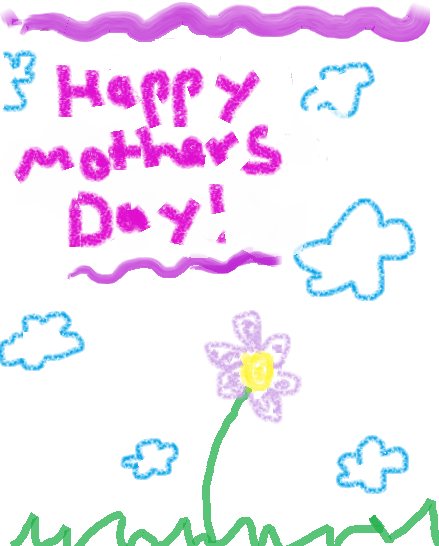 So today, more than a week later, I’d like to say: To all you sacred moms, Belated Happy Mother’s Day! I bow down to all of you with genuine reverence and appreciation. Have you ever had an AHA MOMENT when you realized that you were just skimming the surface of all that you really are? I’d love to know more. This is lovely, and really interesting. 🙂 It is pretty out of this world, Katalina! Diahann, I’m so happy you decided to share your good wishes for Moms everywhere after all!! This is a wonderful piece! Thank you, Audrey! I’m glad I did too.. it’s interesting for me how charged I felt about doing so when it seems that the only one that might have stressed about it had I put it up sooner was me. Hope you are doing great. Enjoy your posts and beautiful art. Beautiful, Diahann. Enjoyed it all and the realization that what you had been mimicking was an idea. I’m sure many do this — in other areas of their life. Love the literal power you felt moving as you did. There is a lot to energy and awareness and health. Acupuncture honors and follows the energy meridians all throughout the body. It’s about unblocking energy where it’s stuck. Thank you for the lovely word of respect for mothers. I’ve no doubt your mother is very proud of you. Thank you, Diana! Are you also an acupuncturist? This is not the first time you’ve addressed energy and healing and you obviously know a lot about it. I meant to add that I resisted (my) femininity through much of high school. Scoffed at it. And then found it startling to hear friends say I sounded so feminine on the phone. I came to embrace the feminine calling as a Christian. I am not only a person, I’m a daughter – not son – of God. I love how you came to embrace your feminine through becoming a Christian. So interesting, really. It’s so amazing how claiming one’s nature can have such a correlation to finding one’s spiritual path! Dihann, I remember that class. I think I only did a couple of classes with you but it was pretty amazing and transformative. Yes, Ivonne! Can you imagine that was 10 years ago? Time flies… it really does. When we live in a culture that values males and masculinity so much more than females and femininity, what you describe is easy to do. I went through the same process, even if it surrounded a slightly different issue from yours.. I’ll have to write about it sometime.. I would love to read about your experience, Georgia. I agree w/ you. And it can be very easy to not know that is what we are doing. Thank you, Becky! Glad you enjoyed it and found that it complements what you are reading now. Thank you, Carol. I know that I sometimes still catch myself in the act of not honoring my own needs… it’s been amazing discover that relationships actually thrive when both people are in their power. This post deeply resonated with me, Diahann. I haven’t felt truly at ease and at home in my body since I was a child. It’s not that I feel my body is bad or something to be ashamed of; I think it is miraculous in all it does to keep me alive and well. But for many years, I’ve felt the presence of an inner judge, watching me with a hyper awareness and monitoring my every thought and action. I know that this judge wasn’t present when I was a small child, so I wonder if it’s largely the result of cultural conditioning. As we became women, how many of us were made to feel ashamed of our bodies? Our consumer culture shames us if we are too fat or too thin, too feminine or not feminine enough. It’s a battle we can never win. I feel that our culture’s definition of a woman’s femininity is horribly skewed. I realized this at a young age and severed myself from it. Like you, I grew to value the masculine over the feminine: I wanted to be independent and never needy; rational and not prey to my emotions. As a result, a profound disconnect occurred. I will certainly try to learn more about the body practice you described in your post; I believe many women could benefit from it. Thanks for sharing your story here. As for the dance, it is an amazing practice. I don’t think anyone who teaches it is based in your area but I know that the two teachers, Vajra and Nita travel to teach when invited and also sometimes do retreats for first timers. Wow! You are a grand ambassador for this Tantric dance. Made me want to try it. In fact all dance forms release some sort of energy. It must have something to do with dismissal of inhibitions [‘Dance like nobody is watching’]. Dance gives grace, strength, poise, endurance and stamina. P.S: Vajra is a celestial missile of Indra, as per Indian mythology. Indra corresponds to Zeus. Vajra corresponds to thunderbolt. Yes- salsa dance releases something too… dancing is really so good for you… I find I get the best ideas when I’m dancing. Oh- did not know that about the name Vajra. A pretty powerful name! I would think Indian dancing as well… especially with all the mudras in some of the movements and poses? I also loved how you transitioned from ‘I care how it looks’ to ‘I care how it feels’ when talking about moving your body. I learnt this from a truly wonderful Qoya dance teacher and a really dear shaman girlfriend Rochelle @ http://www.rochelleschieck.com/ (if ever you can attend her Qoya class or retreat go for it, I’m sure you’ll love it). I really do notice a bigger pattern going on, where we are called to employ our passion, femininity, creativity, sensuality and sexual energy in other ways than ‘serving’ men. Because let’s be honest, men are struggling to keep up with the feminine unfolding, and are not able to control us or even satisfy us the way they used to. Thank you! Yes– it’s a pretty cool revolution happening… who knew.. and I think social media is playing a big part in the wider awareness. I agree w/ you about moms. That space they have to hold so everyone else can do their thing- and she still has to do her stuff too… while making all of it seem effortless. Thank you for the info. I will definitely check out Rochelle’s work! I enjoy your fingers trips across the keyboard. Thank you, Drake, for your comments and kind words about my writing. I agree- men and women different yet equal and that both sides definitely have work to do in shifting awarenesses so certain patterns of relating are resolved. Ultimately that synergy between both genders is what the planet really needs to thrive, I believe. Fortunately, more of us-both men and women-are starting to become aware of the imbalance in dynamics and working to change things up. Thank you! I’m glad you enjoyed reading. Thanks for your comment.